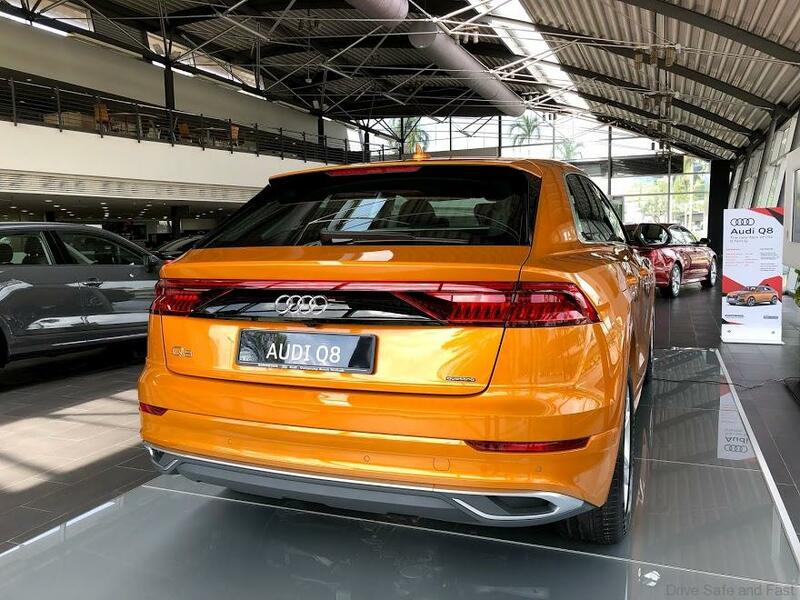 The Audi Q8 has made a quiet appearance in Malaysia at the Euromobil showroom in Glenmarie. 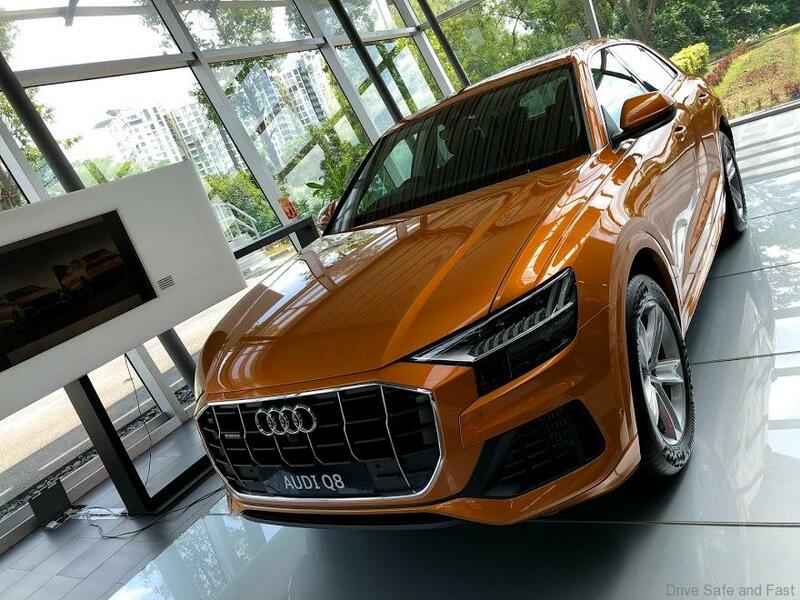 After its impressive arrival in Singapore a week ago, this Q8 order taking starts in Malaysia at a price from RM727k. 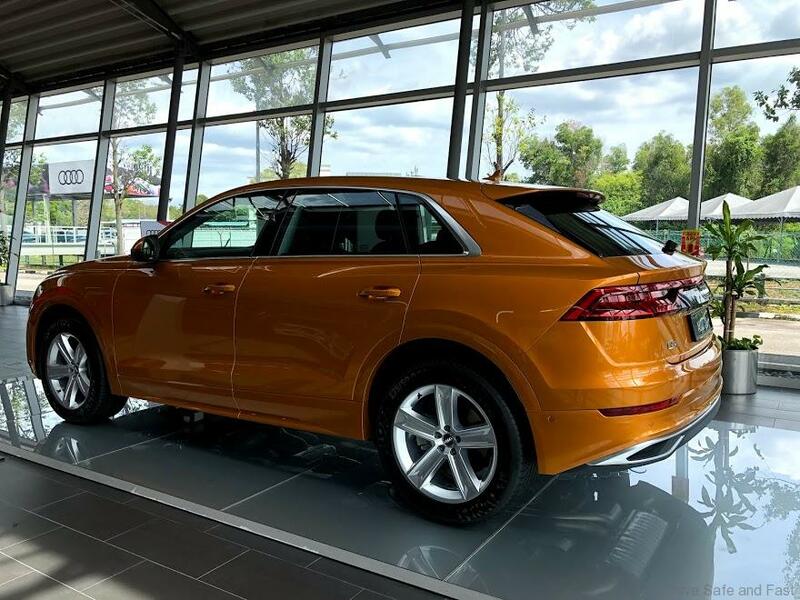 This Q8 3.0L Turbo combines the elegance of a four-door luxury coupé with the practical versatility of a large SUV. Richly equipped, comprehensively connected and tough enough for off-road duty, it is a confident companion for business and leisure. 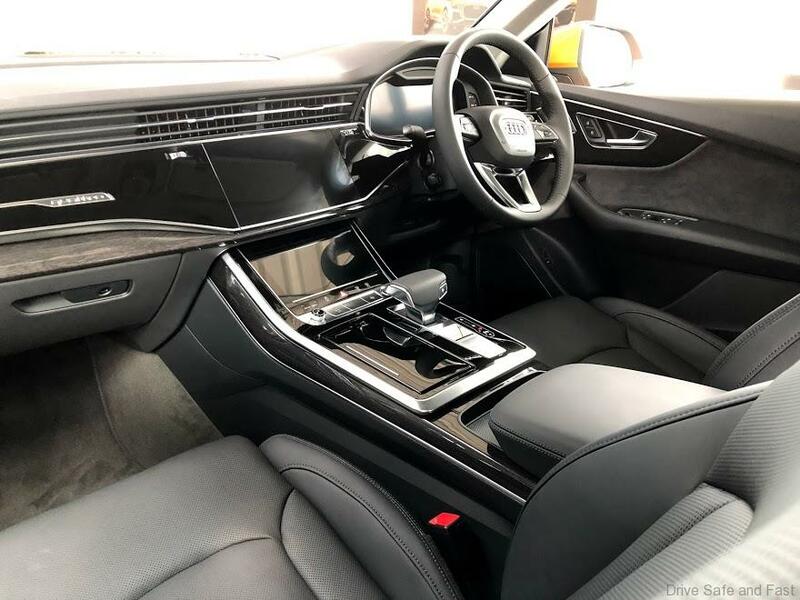 The Audi Q8 exudes sporty dynamics and upscale prestige like no other SUV from the brand with the four rings. 4.99 meters (16.4 ft) long, 2.00 meters (6.6 ft) wide and 1.71 meters (5.6 ft) tall, the SUV coupe is wider, shorter and lower than its Q7 sister model. With a wheelbase of nearly 3.00 meters (9.8 ft), it offers a spacious interior that beats of its direct competitors in most relevant dimensions, including interior length and headroom. There is a three-seat system in the rear with longitudinally adjusting upon request. With the seatbacks folded down, the luggage compartment under the power rear hatch holds up to 1,755 liters (62.0 cu ft). 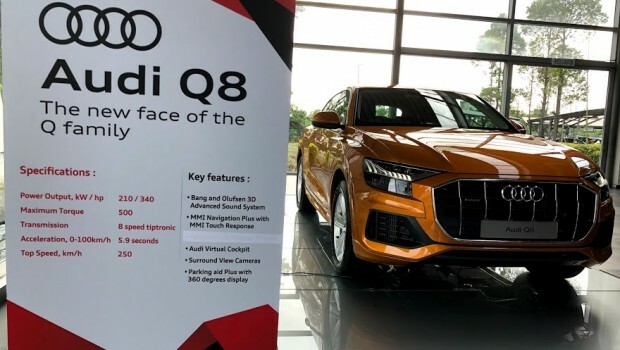 With the imposing Singleframe in octagonal design, the Audi Q8 is the new face of the Q family. The brawny radiator grille stands upright and, together with the spoiler that has been drawn toward the front and the large, highly contoured air inlets, emphasizes the self-confident look. The elegantly sloping roofline terminates in gently inclined D-pillars and rests against the quattro blisters above the wheel arches, which house up to 22-inch wheels. Numerous details hint at the design of the original quattro. Strong contours and athletically tight surfaces convey a feeling of power, sophistication and the special dynamics of the permanent all-wheel drive. The spoiler, wheel arch trims, door trim strips and diffuser are in a contrasting color, to further emphasize the off-road look. Standard LED headlights illuminate the road, with HD Matrix LED technology available as an option. 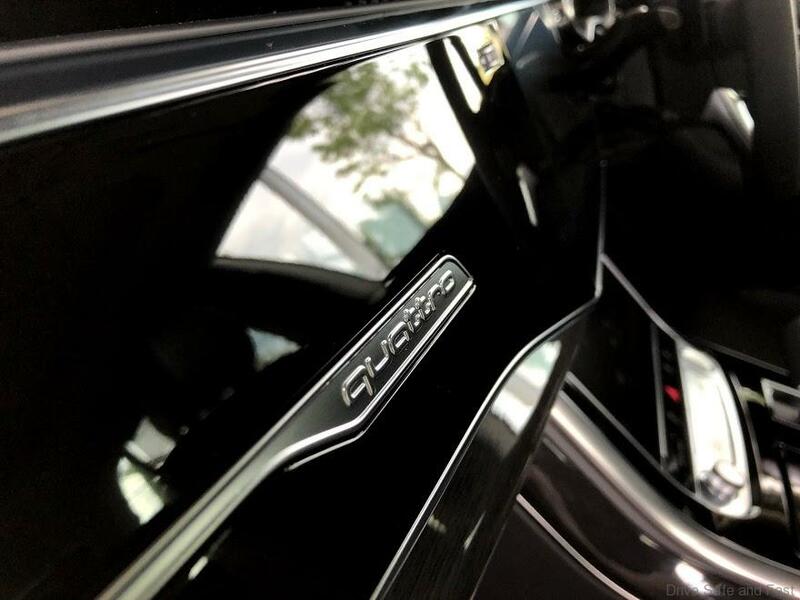 Here both the three-dimensional signature of the daytime running lights and the taillights have a digital character. A light strip connects the units at the rear. As in the original Audi quattro, a black surface underlays this strip. Q8 owners can use the myAudi app on their smartphone to activate various lighting functions and experience them from the outside. Audi is quattro and quattro is Audi – of course this applies in particular to the Q8, the top SUV of the brand. The purely mechanical center differential transfers the forces to the front axle and rear axle at a ratio of 40:60 as standard. When required, it transfers the majority to the axle with the better traction. That plus as much 254 millimeters (10.0 in) of ground clearance, short overhangs and hill descent control means the Audi Q8 can keep going even after the pavement ends. The suspension with damper control is standard. Audi offers the adaptive air suspension with controlled damping as an option, with either comfort or sport setup. It adjusts the ride height depending on the driving situation and the driver’s preference by as much as 90 millimeters (3.5 in). Besides the standard progressive steering, whose steering ratio becomes increasingly direct the further the steering wheel is turned, Audi also offers the option of all-wheel steering. It can turn the rear wheels as much as 5 degrees – counter to the direction of the turn at low speeds to increase agility and at higher speeds in the direction of the turn for better stability. All drive systems are particularly efficient thanks to the new mild hybrid technology (MHEV). The 48-volt primary electrical system incorporates two important technology modules: a lithium-ion battery and a belt alternator starter. During braking, it can recover up to 12 kW of power and feed it back into the battery. The MHEV technology enables long coasting phases with the engine deactivated and a start-stop range that begins at 22 km/h (13.7 mph). Easy-to-understand symbols stand for the digital precision from Audi and for the high level of integration of architecture and operation. The central element is the top MMI touch response display. With its black-panel look, it almost dissolves into a large, black surface when switched off. All elements refer logically to one another, from the flat air vent strip to the wide console on the center tunnel bearing the tiptronic selector lever. In the dark, the optional contour light traces the distinctive design lines of the interior and provides backlight for the three-dimensionally lasered quattro badge above the glove compartment – an example for the love of detail at Audi. 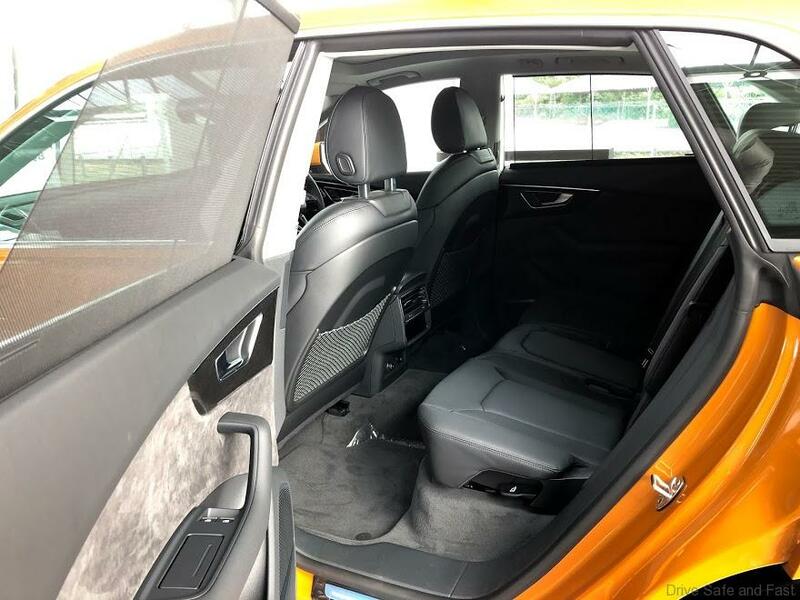 Options including customized contour seats with massage function and ventilation, four-zone automatic air conditioning and the air quality package further enhance the elegant ambiance. With the MMI touch response operating concept of the new Audi Q8, nearly every function can be accessed via two large displays. The upper 10.1-inch display is used for controlling the infotainment and the navigation system. The driver uses the 8.6-inch display below that for heating and air conditioning, convenience functions and text input, the latter with his or her wrist resting comfortably and ergonomically on the selector lever. Operation is swift and simple: A tactile and acoustic click confirms when a finger activates a function. 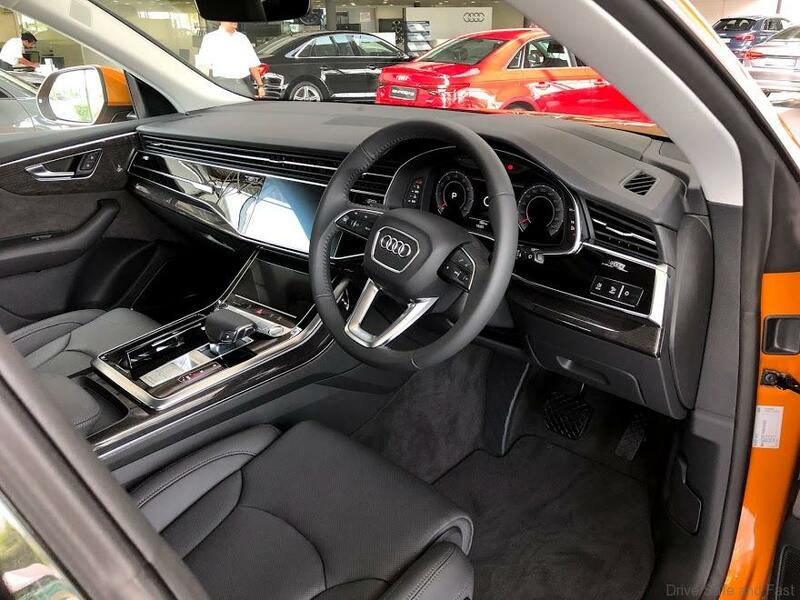 In addition to all this, the natural language voice control turns the Audi Q8 into an intelligent dialog partner. Drivers can word their commands freely. The voice control can, for example, understand the sentence “I am hungry” and in response suggests restaurants close by. The instruments are shown in the fully digital Audi virtual cockpit. Its high-resolution 12.3-inch display can be switched between two views via the multifunction steering wheel. The optional plus version includes a third, particularly sporty view. The head-up display also projects important information onto the windshield, including detailed lane guidance for navigation. Whether parking, in the city or on long journeys – the Audi Q8 supports its driver in many situations. 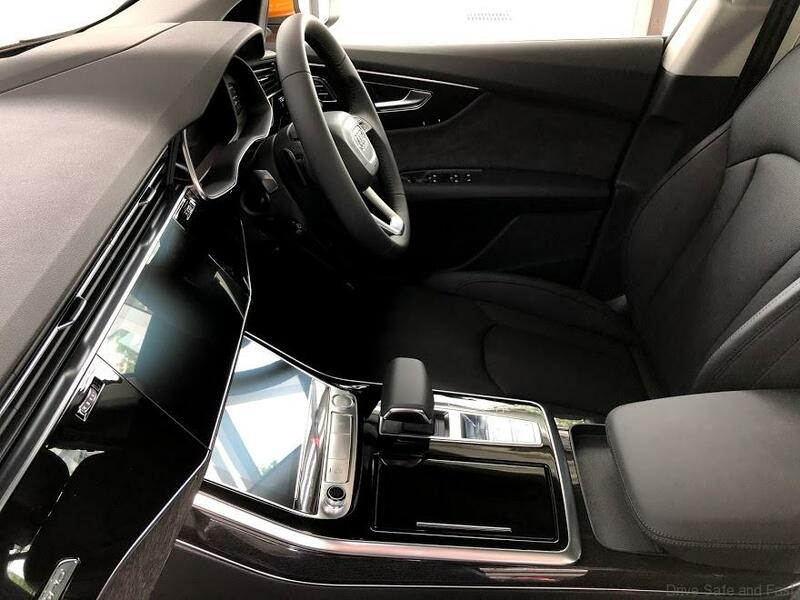 Among the systems contributing here are the adaptive cruise assist, efficiency assist, crossing assist, lane change warning, curb warning and 360 degree cameras. One highlight is the remote garage pilot, which will follow in early 2019. Under the supervision of the driver, it guides the SUV into a garage and back out again autonomously. The driver gets out of the car beforehand and activates the process using the myAudi app on their smartphone. The (remote) parking pilot offers a similar level of convenience. Behind all of these features is the central driver assistance controller. It continuously computes a differentiated model of the surroundings and uses this to manage the assistance systems. The required data are obtained – depending on the selected options – from up to five radar sensors, six cameras, twelve ultrasound sensors and the laser scanner.